What a bold, chest-thumping statement. An unwatchful reader might come off thinking that the Roman Catholic Church played absolutely no role whatsoever in attitudes that led to the killing of the Jews during Hitlers’s regime. Rubinstein here is lumping “the Catholic Church” together with “its teachings”. Even here, “the definition of the word ‘church’” comes into play. I’ve been asked why I picked up this series, “The Popes Against the Jews” just now, and I think that some of the Roman Catholics who wander over here may find this interesting. It’s something that’s hit very close to home with me. I am deeply disillusioned with the Catholic Church, and I have been for a long time. Not that I believe that, in a moral sense, the Church is too strict or anything like that. I would have to say my disillusionment has more to do more with the Church’s attitude about itself. Over the years, my life has been marked by some degree of devotion to Christ. A friend of mine, [name], noticed this and invited me to an “evening of recollection,” sponsored by Opus Dei. I was amazed by the number of relatively young men who sought to follow Christ in such a complete way, in their daily lives. I had mentioned to you once, in passing, that I had been attending these evenings of recollection. At any rate, the guys at Opus Dei started quoting out of the new Catechism the way Baptists quote out of Scripture. I mentioned this to [name], and eventually we got into a friendly religious argument. The basis for the argument was that I believed the Protestant Reformers were justified in protesting the (many) abuses of the Church of the day, and that it was Rome’s response to them that caused most of the schisms. Things got a bit heated (mostly via e-mail), [name] asked to stop the discussion, and I have been quiet about it ever since. But because of that discussion, I looked more intently at the Catholic/Protestant debates (current and past), and I decided that the Catholics are on the short end of that argument. In fact, it is the “official” Roman Catholic response in this matter which speaks as directly to what I am talking about as almost anything except for the massive cover-up of abusive priests by bishops. Generally speaking, these are held to be things outside of the circle, not doctrinally related, except insofar as they stem from the Roman Catholic Church’s definition of itself. This is precisely the “attitude” which is to be condemned. At all times, but particularly in the last two centuries, the Popes, whether individually or together with the College of Bishops, have developed and proposed a moral teaching regarding the many different spheres of human life. In Christ's name and with his authority they have exhorted, passed judgment and explained (Section 4, emphasis in the original). My thought was, where were you, where was this “moral teaching” prior to these “last two centuries”? Rome defines itself in Lumen Gentium,” Vatican II’s “Dogmatic Constitution of the Church. This is Rome’s official definition of itself. Note what is being said here. Christ is both God and man. In the Incarnation, he “assumed” a human nature that is “inseparably united to Him.” In a similar way, the church hierarchy that we have seen throughout history, which claims to be affirmed in itself through an unverifiable “apostolic succession,” – “the visible social structure” of the Church, is “comparably” “inseparably united” to Christ. “The Roman Catholic Church” here defines and identifies itself, (and subsequent statements have affirmed this), as “the one church of Christ” – founded instantly at the moment the words of Matt 16:18 were spoken – in majestic and glorious authority from that moment till the present. 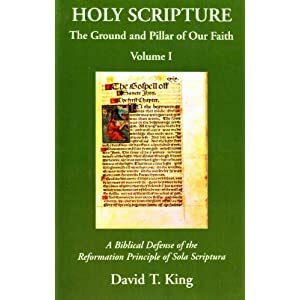 But right here, at the heart of its definition of itself, that Rome not only makes, but emphasizes, another one of its fundamental misunderstandings of what the Scripture is saying. The hierarchy of the Roman Church so completely identifies itself with “Christ” that it has completely cut off its own ability to repent, lest it accuse Christ of sin. Thus this day the Romanists (although they are anything but the true church of Christ) still boast of their having alone the name of church and do not blush to display the standard of that which they oppose. 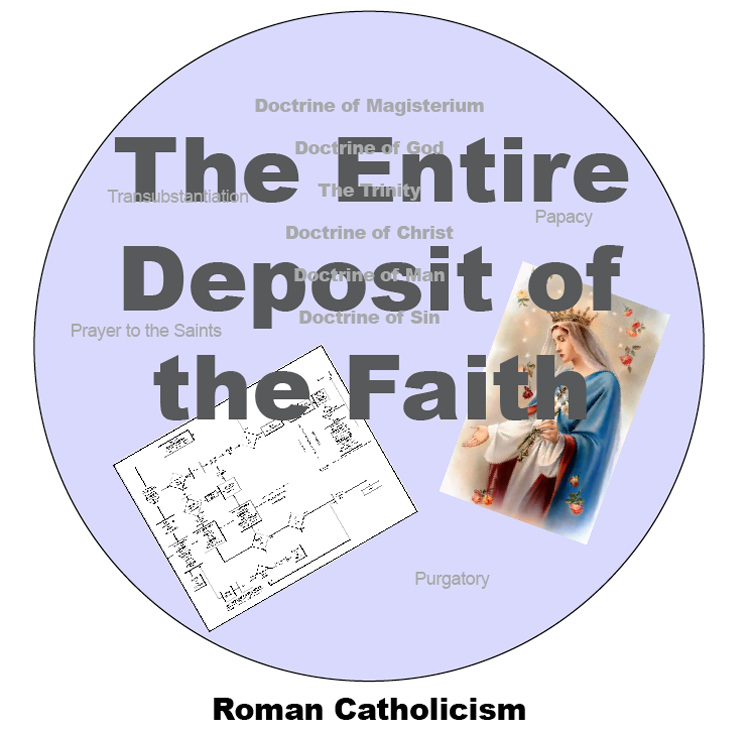 In this manner, hiding themselves under the specious title of the antiquity and infallibility of the Catholic church, they think they can, as with one blow, beat down and settle the controversy waged against them concerning the various most destructive errors introduced into the heavenly doctrine. (Francis Turretin, “Institutes of Elenctic Theology, translated by George Musgrave Giger; edited by James T. Dennison, Jr.: Phillipsburg, NJ, P&R Publishing, ©1997, Vol. 3, pg 2). Being “the pillar and foundation of the truth” is not a call to authoritatively uphold teaching in some infallible way. It is a call to holy living. It is precisely here, as James says, “Show me your faith apart from your works, and I will show you my faith by my works” and “You see that a person is justified by works and not by faith alone.” This is the true place where in Rome’s definition of “the faith” fides quae -- “the teaching” (see Rubinstein above) -- the Roman hierarchy has failed grievously. In its own official document responding to the Holocaust, We Remember: A Reflection On The Shoah, Rome shifts the blame away from itself. Despite the Christian preaching of love for all, even for one's enemies, the prevailing mentality down the centuries penalized minorities and those who were in any way "different". Sentiments of anti-Judaism in some Christian quarters, and the gap which existed between the Church and the Jewish people, led to a generalized discrimination, which ended at times in expulsions or attempts at forced conversions. In a large part of the "Christian" world, until the end of the 18th century, those who were not Christian did not always enjoy a fully guaranteed juridical status. Despite that fact, Jews throughout Christendom held on to their religious traditions and communal customs. They were therefore looked upon with a certain suspicion and mistrust. In times of crisis such as famine, war, pestilence or social tensions, the Jewish minority was sometimes taken as a scapegoat and became the victim of violence, looting, even massacres. By the end of the 18th century and the beginning of the 19th century, Jews generally had achieved an equal standing with other citizens in most States and a certain number of them held influential positions in society. But in that same historical context, notably in the 19th century, a false and exacerbated nationalism took hold. In a climate of eventful social change, Jews were often accused of exercising an influence disproportionate to their numbers. Thus there began to spread in varying degrees throughout most of Europe an anti-Judaism that was essentially more sociological and political than religious. At the same time, theories began to appear which denied the unity of the human race, affirming an original diversity of races. In the 20th century, National Socialism in Germany used these ideas as a pseudo-scientific basis for a distinction between so called Nordic-Aryan races and supposedly inferior races. Furthermore, an extremist form of nationalism was heightened in Germany by the defeat of 1918 and the demanding conditions imposed by the victors, with the consequence that many saw in National Socialism a solution to their country's problems and cooperated politically with this movement. The Church in Germany replied by condemning racism. The condemnation first appeared in the preaching of some of the clergy, in the public teaching of the Catholic Bishops, and in the writings of lay Catholic journalists…. Thus we cannot ignore the difference which exists between anti-Semitism, based on theories contrary to the constant teaching of the Church on the unity of the human race and on the equal dignity of all races and peoples, and the long-standing sentiments of mistrust and hostility that we call anti-Judaism, of which, unfortunately, Christians also have been guilty. We deeply regret the errors and failures of those sons and daughters of the Church…. At the end of this Millennium the Catholic Church desires to express her deep sorrow for the failures of her sons and daughters in every age. This is an act of repentance (teshuva), since, as members of the Church, we are linked to the sins as well as the merits of all her children. This is not repentance. At its most fundamental level, the call of Jesus to “repent” (Matthew 4:17) is just simply Christ’s call to take accountability for the one serious moral issue that we all face, sin, and to reject it. Man sins and offends God; the one and only response that Christ asks of us is to “repent” in the face of this sin. It is the only response. Rome not only fails to repent. It has irrevocably defined itself out of both the need to and the ability to repent. It shifts blame to “the sons and daughters” of “the Church”. “The Church” itself refuses to repent. And in doing so, it exhibits “the fruit” by which it is recognized (Matt 7:16). In our day, what do we call a person who refuses to take responsibility for his own actions? We have a word for that. I just can’t think of it right now. The Pharisees did not like Jesus accurately describing Phariseeism, accurately describing its man-made traditions, and accurately describing the Pharisees that Phariseeism produced. "The hierarchy of the Roman Church so completely identifies itself with “Christ” that it has completely cut off its own ability to repent, lest it accuse Christ of sin." Nicely put. I believe this is exactly right, and is the root of their pathology. I think in the previous post someone commented that Germany was Lutheran. Southern Germany, particularly the Rhineland and Bavaria are heavily Catholic. The blame goes all around. I wonder how much of the decline of the state churches--Lutheran and RC-- in Germany is due to complicity in the Holocaust? If the RC thinks it shouldn't have to repent because it thinks it is THE Church, all it has to do is look in the book of Revelation, chapters 2 & 3. Christ called church-es to repentance with some pretty stern warnings. I think in the previous post someone commented that Germany was Lutheran. Southern Germany, particularly the Rhineland and Bavaria are heavily Catholic. The blame goes all around. I didn't see the comment about Germany being Lutheran but the pastor is right – southern Germany and Bavaria are “heavily Catholic”. And that is important because that is where Hitler grew up. He was heavily influenced by the mayor of Vienna, Karl Lueger who was a virulent anti-Semite. And Lueger was the leader of the “ Vatican-supported anti-Semitic Christian Social movement”. Kershaw, Ian. Hitler: a biography. London: W. W. Norton & Company, Ltd., 2008. p. 295f. The Catholic church was “easier to handle” because of the Concordat it had signed with Hitler in 1933. That Concordat had effectively undermined the German bishops ability to speak out against the Reich. Kershaw notes that Hitler was surprised by how easily the Vatican had “commit[ted] the bishops to this state” and he continued to use the Concordat throughout his reign to silence the Catholics in Germany. No Protestant church had any such agreement. So while the “blame goes all around” it does not do so proportionately. What John Bugay will show us is that the holocaust was the inevitable result of a centuries-long abuse of the Jews by the Roman Catholic church. I can't find where I saw the comment I referenced... sorry for bringing it in. My previous post wasn't meant as a critique of your comment so please don't take it that way. I was just offering some clarification. In keeping with the theme of this series I give a Luther classic: The Jews and Their Lies. Are you the "Raymond" who put together the "Luther, Exposing the Myth" web page? A yes or no will be just fine. Eck makes Luther seem like a Kindergarten teacher on this subject. John have you read "Constantine's Sword" by James Carroll? Hi john, I have not read it; can you give me any hints? "Constantine's Sword is a sprawling work of history, theology, and personal confession by James Carroll. Carroll begins his landmark project by describing contemporary Catholic remembrances of the Holocaust and the Church's intolerable legacy of hostility towards Jews. He then surveys Catholic anti-Judaism beginning with the New Testament and proceeding through the early Church, the Crusades, the Inquisition, the Enlightenment, and World War II, before concluding with "A Call for Vatican III," a Church council that would make meaningful repentance for an entrenched tradition of hatred. Carroll's prescriptions for repentance, continued in a powerful epilogue, are bracingly concrete: "there is no apology for Holy Week preaching that prompted pogroms until Holy Week liturgies, sermons, and readings have been purged of the anti-Jewish slanders that sent the mobs rushing out of church.... Forgiveness for the sin of anti-Semitism presumes a promise to dismantle all that makes it possible. Constantine's Sword is an interesting read - and it is "sprawling" to be sure. The problem is that the author is summarily rejected by Catholics because he is a former priest. It does have some good historical insight into John's topic. Constantine, I want to thank you for bringing this all to my attention. Is there blame to go around? The distinction between Catholic and Lutheran is rather artificial inasmuch as Luther was Catholic before he was Lutheran. Although he broke with Rome, there's still a lot of cultural and theological carryover. And that, in turn, impacts the German Lutheran tradition. What Constantine mentions comes out in this important book: "Hitler's Pope". In his enforcing of canon law, Pope Pius, the former nuncio to Munich, neutralized the Catholic Centrist Party. This was a huge factor in making Hitler's rise possible. I would offer a word of caution on the book you cite, however. Cornwell apparently overstated his case and was forced to recant some of the accusations he makes in this book. Roman Catholics have been well trained to look for this title and come out in force against it. Phayer addresses, in a very interesting and scholarly way, the over zealous support for Pius XII that is now all the Roman rage. And he judiciously lays to rest the idea that Rome was a friend to the Jews of the early 20th century. Thanks, John Bugay, for your leadership on this! thanks for the other link and the caution. I am not really into confronting RC's per se. I don't think that religion really had a role in inspiring Hitler's racial policies, neither Luther nor the pope. Anti-semitism is a sad fact of history, but was not rampant in the German population at Hitler's time. Luther's pamphlet was totally not a factor. Yet, the role of Pius and his reasons in interfering in the activities of German Catholics still needs to be understood for what that was. How was the pope able to have influence on the political situtation? I went to Catholic school in Bavaria, the Pople's country, and we academic girls seemed to spend so much of our time learning things about the dilemmas and atrocities of the war, it haunted me. There was always much chest beating and mea culpas. This should also be acknowledged somehow. Hi Brigitte -- Sorry I haven't been around her to comment much. Lot of things going on this week. I'm running with this series for a couple of reasons. First is Rome's ability (and that of its apologists) to completely distance itself from any responsibility in this matter, despite centuries of abuse. Second is to put Luther into some kind of context. As I've mentioned, Eck's works of that time make Luther appear to be a Kindergarten teacher. And third, it's just another dimension -- a "real-life" dimension to some of the theological issues that we get into. It's another piece of context that really adds some life to the period. John, I don't mean to say that it's not worthwhile. There are so many angles to it and truth matters. How wonderful that you lived in Bavaria! Do you miss it? Not to be overly contrary, but I must take exception to your comment that religion didn't really have a role in inspiring Hitler. What John Bugay will show us is precisely the opposite. That it was the Roman Catholic Church, with its official policy of enslaving the Jews and demeaning them through their official publications and even the Good Friday Mass (!) - of parading them naked through the streets of Rome - that led undeniably to the Holocaust. Religion had a crucial and central role in forming Hitler. And that religion is that of the Roman Catholic church. The inquisition for sure targeted Jews. We know that. Brigitte: The inquisition for sure targeted Jews. We know that. I'm amazed to see just how "targeted" the Jews were over time. James Swan has written extensively about not taking “personal conversion stories” too seriously, and he recommends, that if we are going to tell personal stories, that we tell the story of Jesus. clarification: I don't approve of them as apologetic tools, so in dialog with non-Christians, the story to tell is the Gospel story. This is all part of my reaction to Romanism's "Surpised By Truth" stuff. Each of us has a story, and God's work in our lives should be used to encourage each other. There is a time and a place for out story, and a time and a place for the Gospel. James, I've gone back and removed that part of it. I know, but this is a series that I'd like to think will have some lasting value, so it doesn't hurt to keep things more generic.